Ava DuVernay became the first African-American to win the Best Director award at Sundance this year for her indie drama, “Middle of Nowhere.” Although “Middle of Nowhere” is only DuVernay’s second full-length feature film, she’s no newcomer to the industry. In fact, she’s already made a name for herself as one of the preeminent figures in modern African-American cinema, even before her history-making win at Sundance. In addition to running her renowned marketing firm, The DuVernay Agency (later DV Marketing + Media), where she worked with directors like Steven Spielberg, Clint Eastwood, Kevin Smith, and Robert Rodriguez, DuVernay won the Best Screenplay Award from the African-American Film Critics Association for her first feature film, “I Will Follow.” She also launched an ambitious, groundbreaking film distribution movement in 2010 called AFFRM (African-American Film Festival Releasing Movement), which organizes film festivals and theatrical releases for black indepedent films. “Middle of Nowhere” has been met with great acclaim since its premiere at Sundance. 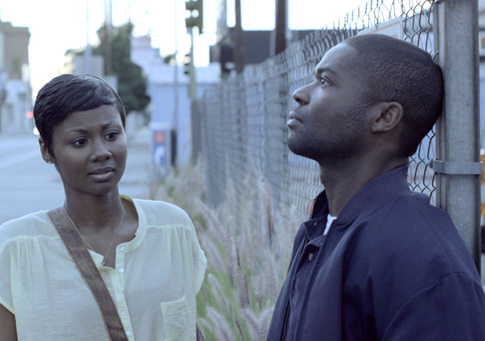 Starring Emayatazy Corinealdi in a powerful debut performance, the film is an intimate portrait of an L.A. woman’s life as she awaits her husband’s release from prison. 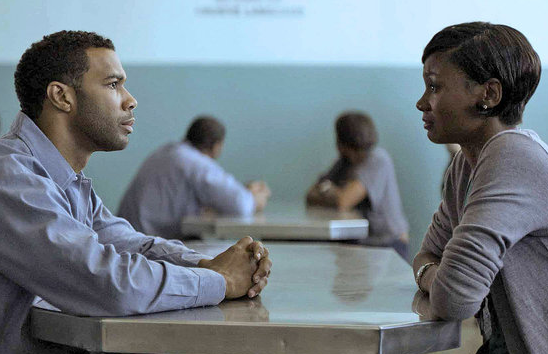 With evocative music, a somber color pallette of steel greys and blues, and a poetically melancholic screenplay, DuVernay’s vision translates beautifully to the screen. “Middle of Nowhere” opens in select theaters October 12. DuVernay sat down with Indiewire to discuss working on the set and how she got started as a filmmaker. I know that you first entered the film industry on the marketing end. Yeah, I was a publicist – I did what these guys are doing for a long time – at an agency that specialized in film. I represented some big films like “Dream Girls” and “Invictus.” The last film I represented before I shut down my agency to become a filmmaker full-time was “The Help.” So it was really very recent, just last summer. And, yeah, it gave me a good understanding of the business of filmmaking, which I think has been really helpful to me. Did you always want to be a filmmaker, or did you just see yourself sticking to the publicity side? Well, I think it was just the proximity to filmmakers over the years working as a publicist, kind of gave me the bug. I always loved film, so I always knew I wanted to work around it. I thought being a publicist was as close as I was going to be, and I loved being a publicist. But somewhere down the line I started writing my own scripts, making shorts on the weekend while I was running my business. Just one thing led to another. So you made shorts and documentaries first. What made you decide to transition to feature filmmaking? For me, I don’t really see it as a transition. It’s all storytelling. So it’s just a question of what’s the most effective way to tell a story I want to tell. Some you can just get more truth out of narratively, and others are just, you know, more documentary style. It’s just different tools to me, as opposed to a transition from one to the other. I really love docs, I’m making one now about Venus Williams. I like the idea of going back and forth. I really admire Werner Herzog and Spike Lee. They’re amazing documentarians. If you took away all the narratives, they’d just be amazing documentarians. I hope I can continue to do both. Which do you find to be more challenging? Definitely the narratives. In documentaries there’s a truth that unfolds unnaturally, and you get to chronicle it. In narratives, you have to create the situations so that the truth will come out. You know, and with a documentary you’re following something, and with a narrative you’re collaborating with people to create something. So, you know, they’re both amazing experiences. But I’d say, if I was just having a bad year and wanted to make something that was a little bit easier, probably would choose a doc. That’s the great thing about being able to make a documentary – if there was ever a situation where I can’t get all the money together for one of my scripts, I could always take my camera out and follow an interesting story. Just still tell a story without a lot of money. You promoted both “I Will Follow” and “Middle of Nowhere” through the organization you founded, the African-American Film Festival Releasing Movement? How much progress have you made since launching AFFRM? AFFRM was an idea that really asked the question, could we create something that’s like a farmer’s market to the Hollywood supermarket. Could we create something that was really focused on grassroots, hand-grown films that were really put out with love by local organizations. Really, that comparison is so true to what we do. And, the answer has been yes. We launched in January of last year, our mandate was to release two films a year. We’ve done that. The first year was “I Will Follow” and “Kinyarwanda” which won Sundance, an Audience Award at Sundance. Second year, this year, was “Restless City” in the spring and “Middle of Nowhere” in the fall. So, what I wanted to do was just to really handpick films that we all felt were really beautiful and to give them a chance at a theatrical release. And it’s been working nicely. As a female African-American director, do you feel at all limited in the types of films you can set out to make? Or any pressure to make a certain kind of movie? That’s a great question. No, I don’t feel like I can’t make anything I’m interested in making. And, am I going to have studio support? That’s a different question. Can I make anything I want to make, do I have the ability to do whatever I want to do? I believe I do. But, will I have support in an institutional way, in terms of a corporation giving me money to do it, is a different question. I think that’s the case not just for me as a black woman, but for any filmmaker, or any artist that wants to do something. We can, but will we be supported is a different question. I don’t feel limited in the kind of stories that I can tell. I like telling stories about black women. There’s something really important about stories about black women and girls, being told by black women. I think that’s going to give you a different reflection, as opposed to an interpretation of what our lives are like. So, we have a lot of films right now, a lot of black women or black girls that are told from the point of view of someone that’s not us, and it just needs to be really clear that that is an interpretation of who we are, as opposed to a reflection of who we are because the person making it is part of our group. I know that you filmed for only 19 days. Was it difficult filming over such a short period of time? For the role of Ruby, did you set out to cast an unknown actress as opposed to a familiar face, or did it just end up working out like that? I was just looking for the best actor. And I felt that even though we had the opportunity to cast some people of note, someone that you’d know, for me I was just really looking for someone that had a vulnerability with a strength – a very specific strength and vulnerability that I thought Emayatzy brought in spades. So I think it’s just really a lesson that the best actor isn’t always the actor that we know, you know what I mean? We were really just allowing ourselves to be open to finding the right actor. But it’s tough. I was lucky that my financing wasn’t contingent on casting, so I had more freedom. I could pick whoever I wanted. A lot of times you’re restricted to certain names to get the money, but luckily for us that wasn’t the case, and I was able to just go with my gut and I’m glad I did. How was it for you working with Emayatzy on “Middle of Nowhere”? What was your creative partnership like as director and actor? I think for me, the key was that when I cast her, I really liked her as a person. And all of our collaborations were rooted in that recognition of a kindred spirit – just a woman that was an artist, but also has a lot of integrity and dignity in her choices that she had done up to this point. This isn’t her debut because she couldn’t get any work. It was her debut because she chose not to take lesser work, and she was waiting for a specific kind of part. So, yeah, I just really thought she was an amazing person. For me, the collaboration was just sort of rooted in you know, a respect for who she was. And she gave me that mutual respect. If that’s the core of it, then you approach talking about scenes from a place of collaboration rather than, “I’d like you to do this.” You know, it’s more, “How do you feel about this?” and “I think this.” And, so it was really lovely. It was really cool. I’m really influenced by a director named Haile Gerima. He came from UCLA, a film student like I was, but maybe 50 years ago. And he’s now a professor at Howard University in D.C. And he’s a black filmmaker who has made very personal films, very political films outside the studio system for decades. He really kind of stuck to his guns and always directed films that were his vision. No notes from anyone, no one trying to guide him, like “It might be better this way.” Sometimes his films are challenging or difficult, some of them are accessible. But the bottom line is he has expressed his vision consistently for decades and I think, really beautifully. I love his work and I love what he represents.